MSI សញ្ញាបត្រ offers a great (no experience required) Six Sigma Black Belt certification course guaranteed to help you advance your project management career. MSI ជាអាជីវកម្មខ្នាតតូចទទួលស្គាល់, គ្រប់គ្រងដោយអតីតយុទ្ធជន, ដែលមានមូលដ្ឋាននៅសហរដ្ឋអាមេរិក. ផ្តល់ជូននូវការធានាប្រាក់ត្រឡប់មកវិញ 30 ថ្ងៃនិងខ្សែក្រវ៉ាត់ស្បែកសដោយមិនគិតថ្លៃ 20 ជាការពិតណាស់នាទី, MSI សញ្ញាបត្រធ្វើឱ្យវាងាយស្រួលក្នុងការជ្រើសរើសពួកគេសម្រាប់តម្រូវការវិញ្ញាបនប័ត្រវិជ្ជាជីវៈរបស់អ្នក. MSI មានតែមួយគត់ជាតង្វាយ o េចជាការពិតណាស់សខ្សែក្រវាត់ដែលត្រូវចំណាយពេលប្រហែល 20 នាទីដើម្បីបញ្ចប់ដែលនឹងផ្ដល់ឱ្យអ្នកនូវវគ្គសិក្សារបស់ពួកគេមើលទៅដូចជានិងរបៀបដែលពួកគេមានអារម្មណ៍. នេះជាផ្នែកមួយដែលល្អបំផុតអំពីការពិតណាស់សខ្សែក្រវាត់គឺថាវាជាដោយឥតគិត. វាបានបញ្ចប់ជាមួយនឹងការប្រឡងវិញ្ញាបនប័ត្រ 15-សំណួរ. នេះគឺជាវិធីល្អឥតខ្ចោះដើម្បីណែនាំវិធីសាស្រ្តនៃការប្រាំមួយ Sigma នេះ, ជាពិសេសប្រសិនបើអ្នកគិតថានិយោជកបច្ចុប្បន្នឬអនាគតនឹងផ្តល់ជូននៅក្នុងផ្ទះបណ្តុះបណ្តា Sigma និងវិញ្ញាបនប័ត្រ. ជាមួយនឹងដៃគូប្រកួតប្រជែងមួយចំនួនដែលផ្តល់ជូនតែវិញ្ញាបនប័ត្រ, MSI ឈរជាមួយនឹងហ្វូងមនុស្សតូចមួយសម្រាប់ជាការពិតណាស់និងវិញ្ញាបនប័ត្រ. តម្លៃនៃការវិញ្ញាបនប័ត្រនេះត្រូវបានរួមបញ្ចូលផងដែរនៅក្នុងវគ្គសិក្សានេះ, ការធ្វើឱ្យការចំណាយសរុបនៃកម្មវិធី MSI សមរម្យ. ពួកគេបានសូម្បីតែផ្ញើច្បាប់ចម្លងនៃវិញ្ញាបនបត្ររបស់អ្នក. និងព្រឹត្តិបត្រពិន្ទុរបស់អ្នកនឹងត្រូវតែងតែអាចរកបានសម្រាប់និយោជកនាពេលអនាគត. ទាំងអស់នៃការបណ្តុះបណ្តាលនេះគឺបណ្តាញនិងមានរចនាសម្ព័ន្ធនៅក្នុងលក្ខណៈដែលអាចបត់បែនបាន, អនុញ្ញាតឱ្យអ្នកទទួលយកការពិតណាស់នៅក្នុងល្បឿនផ្ទាល់ខ្លួនរបស់អ្នក. អ្នកអាចបង្កើនល្បឿនតាមរយៈការវាប្រសិនបើអ្នកមានពេលវេលាឬផែនទីវាចេញក្នុងរយៈពេលមួយឆ្នាំ. ជាការពិតណាស់នេះជាមួយឆ្នាំបន្ទាប់ពីការផុតកំណត់ការទិញ, ផ្ដល់ឱ្យអ្នកនូវពេលវេលាច្រើនដើម្បីបញ្ចប់ការពិតណាស់នេះ. The exam for the MSI Six Sigma Professional Certification is timed, but it’s open note allowance makes sure you’ll pass. This doesn’t mean you’ll have access to the online study materials, so you’re not going to be looking up specifics answers, but you’ll be able to use any notes you took from studying. This doesn’t mean you won’t have to learn the material, but it will help to eliminate any testing anxiety. អ្វីគ្រប់យ៉ាងដែលអ្នកត្រូវការដើម្បីទទួលយកការពិតណាស់នេះ, ការសិក្សា, និងឆ្លងកាត់ការប្រឡងដែលត្រូវបានរួមបញ្ចូលនៅក្នុងតម្លៃមុខឡើង. មិនមានថ្លៃដែលបានលាក់មាន. អ្នកនឹងមិនត្រូវទិញមគ្គុទេសក៍ការសិក្សាបន្ថែមឬសៀវភៅសិក្សា. អ្វីគ្រប់យ៉ាងត្រូវបានផ្តល់ជូន, ទោះបីជាការប្រឡងនេះ. អ្នកមានសាមសិបថ្ងៃពីពេលវេលានៃការទិញនេះដើម្បីសម្រេចថាតើអ្នកចង់បន្តការពិតណាស់ដែលឬទទួលសំណងមួយ. The ideal user for the MSI Six Sigma course is someone who isn’t sure if they want to explore Six Sigma in the first place. It’s the perfect course if you want to explore it a little, risk-free. The flexibility to choose when and how quickly you complete the course will appeal to those who aren’t sure what they’re schedule will look like in the long term. The open note style exam will help you if you suffer from testing anxiety. 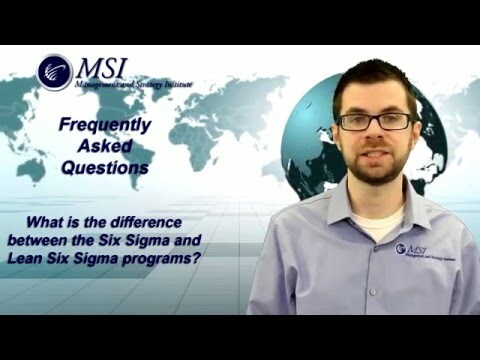 If you’re on the fence about Six Sigma and it’s value or you’re looking at prospective employers that conduct in-house Six Sigma certification, then MSI is a great company to try for initial Sigma exploration. The free White Belt course coupled with the 30-day money-back guarantee makes it easy to choose MSI and feel confident you’ve made a good choice. ខ្សែក្រវាត់​ខ្មៅ តំលៃ​លក់: $299.95 DMAIC alongside DMADV variation; Manufacturing with Muda, Mura, Muri; Process Maps; PDCA with Critical Path Analysis; Final Exam.